Two limited time modes have also been added, and one removed with new update. As "Fortnite" continues to be the most popular game on the face of the planet, credit developer Epic Games for continuing to change and add things to the title, drawing more and more people in. The latest development landed in the middle of the night. For most users, that was around 3AM on Wednesday. Concerning the name, it might be surprising to some that an update with a title like update 5.21 would have as much content as this one does. As PC Gamer reports, the most anticipated addition to arrive in 5.21 is the introduction of a brand new heavy sniper rifle. "Fortnite" players have known this weapon was going to be hitting the title at some point since back in July. The problem for those who were all sorts of excited about it is that Epic never really said when their characters would be able to get their virtual hands on it. So why is this new weapon so heavily anticipated? As Eurogamer points out, the heavy sniper rifle isn't talking about the weight of the weapon. Rather, the gun itself will be able to see through and blast through walls. Even when it is going through the first wall it hits, it will also be dealing a ton of damage. That damage equals about 157 points. In other words, there are some people who will get taken down (or almost taken down) in one blast. It also takes out 1100 points from structures. The bottom line is that anyone who can find this weapon in the game is going to be quite happy, quite deadly, and quite hard to beat. Interestingly, now that the heavy sniper rifle has arrived in "Fortnite" other assault rifles have been tweaked to the point where they won't have scopes. This tweak will force players to choose whether they want to kill from afar or up close. The heavy sniper rifle is the newsworthy addition, but far from the only reason "Fortnite" got update 5.21. There are also two new modes called "Sniper Shootout" and "Soaring 50s." The first new mode should surprise no one in that it only allows people to use sniper rifles. The "Soaring 50s" version will allow people to use gliders whenever they jump from an elevated spot. 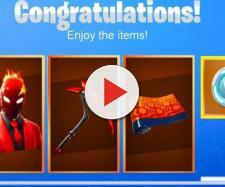 They will also have more access to tools like Impulse Grenades, Bounce Pads, and Launch Pads. In other words, players are going to be spending more time in the air. The final change coming to "Fortnite" in update 5.21 is the end of Steady Storm Mode, which IGN reports came in update 5.20. Update 5.21 is live on all available "Fortnite" platforms, including almost every electronic device these days.